Abhedya or Abheda (Skt. ; Tib. མི་ཕྱེད་པ་་, Michepa; Wyl. 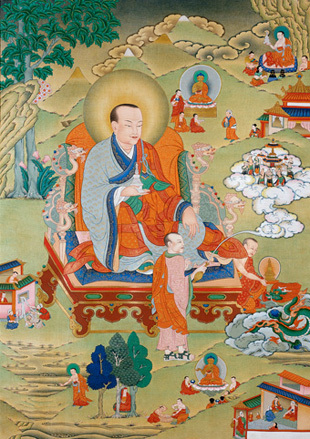 mi phyed pa), aka Subinda — one of the Sixteen Arhats. Born in a brahmin family he was an exceptionally beautiful child. As a youth he was known for his modesty and compassion and had a keen intellect. When he met the Buddha he requested ordination and joined the Sangha. Studying and practising with great energy, he attained realization and became an arhat. He dwells with 1,000 arhats on Mt. Gangs-can, near Shambhala, north of India. Abhedya holds an enlightenment stupa given to him by the Buddha to overcome negative forces when he went to the land of the yakshas. Those who meditate on it gain fortune and merit and open the way to realization. Crystal Mirror, volume VI, Dharma Publishing 1984. This page was last edited on 12 December 2016, at 13:18.